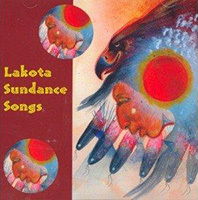 CDs and cassettes IDs for ordering start with Lakota Songs - LS. 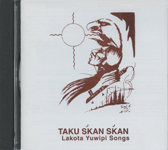 Lakota Songs for the Common Man. Purification Ceremony. Rounds one through four by David Swallow, Jr. and Nyla Helper. by Dwight Provencial, Sr.; Harold White Horse; Joe Yellow Robe; Johnson Running; and Cy Sanchez. Wicaglata: Elva Thompson. 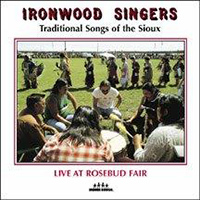 (CD) From Rosebud, South Dakota..Twelve songs with translations including Ghost Song, Bear Songs, and Four Direction Song. 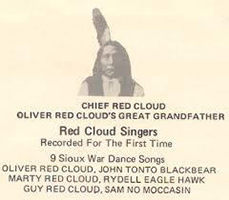 16 Old traditional Sioux Songs by Matthew and Nellie Two Bulls, Matthew Two Bulls, Jr., and Everette Lone Hill. War Dance Songs, Sioux National Anthem, Veteran Honoring songs, and Rabbit Dance songs. 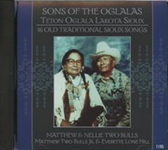 12 Old traditional Sioux Songs by Matthew and Nellie Two Bulls, Matthew Two Bulls, Jr., and Everette Lone Hill. War Dance Songs, Sioux National Anthem, Veteran Honoring songs, and Rabbit Dance songs. Featuring Porcupine Singers, Manderson Singers, Pass Creek Singers, Kiyuksayapi Singers and Eagle Mountain Singers. Ten songs including Intertriball, Staight song, Contest Song and Woman's Fance Song. Severt Young Bear, Sr., Henry Green Crow, David Clairmont, James Clairmont, Frances Menard, Ronnie Theisz, Calvin Jumping Bull, and Philip Wright. 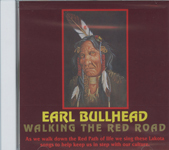 Ten traditional songs including National Anthem and Vet's song, Little Big Horn Battle song, Sneak-Up Dance, Jealous Woman, Bark of the Dog, Song of the Fallen Warrior, and Birthday song. Contains: 1. Pipe Song; 2. Four Directions Song; 3. Spirit Calling Song; 4. Sundance Son Sundance Song; 6. Pipe Song; 7. Fasting Song; 8. Sundance Song; 9. Sundance Song; 10. Four Directions Song; 11. Sundance Song; 12. Exit Song; 13. Dedication. 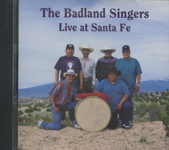 The singers are:Harold Condon, Kenny Haukaas, Robert Kim King, Harvey Larvie, Stan Pretty Paint, Ernie Ray Running, George Whirlwind Soldier, Dave White, and Sandra Black Bear White. 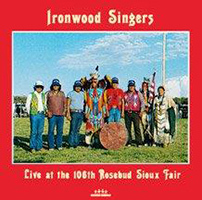 Recorded live by Tony Isaacs of Indian House at the 106th Rosebud Fair August 28-30, 1982. 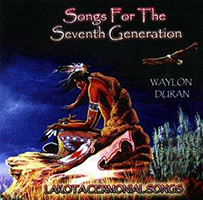 1) Song for Warrior Wounded in Battle, 2) Sneak-up Song, 3) Veteran’s Song; 4) Love Song, 5) Charge the Enemy Song, 6) Trick Contest Song, 7) Trick Contest Song, 8) Grass Dance Song, 9) Sneak-up Song; 10) Stomp Dance Song; 11) Old Sioux War Dance Song; 12) Old Sioux War Dance Song; 13) Northern Grass Dance Song; 14) Victory Song. 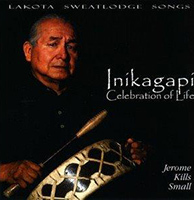 Sung by the late Ben Black Bear, Sr, organizer of the group, and Kenny Haukaas, Harvey Larvie, Ernie Running, David White, and Ervin Yellow Robe. Recorded live by Tony Isaacs of Indian House on August 25-27, 1978 at the 102nd Rosebud Fair. Ben Black Bear, Sr also appears on Songs and Dances of the Lakota (which see on this web site). 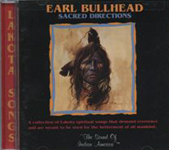 He is regarded by his people and all who knew him as an exemplary singer and historian of Lakota song and dance. 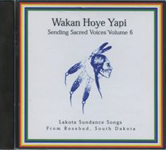 1) Sioux Flag Song; 2) Veteran’s Song; 3) Honor Song; 4) Traditional Grass Dance Song; 5) Killing-of-the-Enemy Song; 6) War Dance Song; 7) War Dance Song; 8) Killing-of-the-Enemy Song; 9) Enemy Song); 10) Victory Song; 11) Peace Song. Contains: 1. 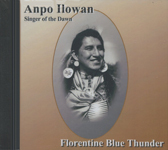 Cannunpa Olowan (Pipe Song); Tatuye Topa (Four Directions Song); 3. 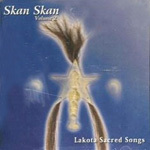 Wanagi Wicakico (Ghost Calling Song); 4. 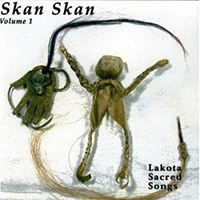 Wicakico Olowan (Calling Song); 5. 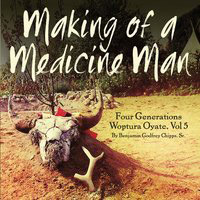 Wapiya Olowan (Doctoring Song); 6. Wapiya Olowan); 7. 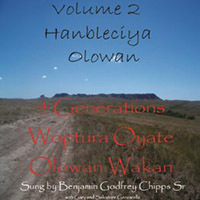 Wicahpi Wapiya Olowan (Calling Song for the Stars); 8. Wapiya Olowan (Doctoring Song)); 9. Pejuta Olowan (Medicine Song); 10. 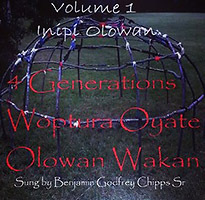 Wapiya Olowan (Doctoring Song); 11, Wanagi Wapiya Olowan (Ghost Doctoring Song); 12. Waunye Olowan (Offering Song);,13. Waunye Olowan (Offering Song); 14. Wicakico Olowan (Calling Song); 15. 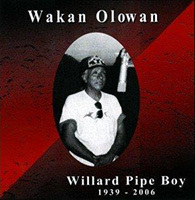 Hanbleceya Cannunpa Olowan (Pipe Song for Vision Quest); 16. Hanbleceya Olowan ( Vision Quest Song); 17. 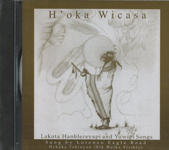 Wowaglaka Olowan (Talking Song); 18. Inktomi Olowan (Spider Song); 19. Inktomi Olowan (Spider Song); 20. 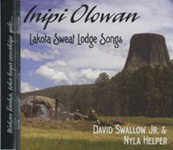 Inipi & Hanbleceya Olowan ( Sweat & Vision Quest Song); 21. Inipi and Hanbleceya Olowan (Sweat and Vision Quest Song); 22. Inipi and Hanbleceya Olowan (Sweat and Vision Quest Song); 23. (Y)ujuju Olowan (Untying Song); 24. 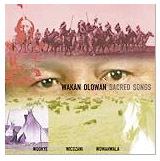 Wowaglaka Olowan (Talking Song); 25. Wowaglaka Olowan (Talking Song); 26 Wowaglaka Olowan (Talking Song); 27. 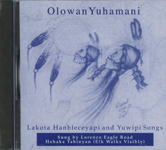 Wanbli Gleska Olowan (Spotted Eagle Song); 28. Kiglape (Leaving Song); 29. Wapiya Olowan (Doctoring Song); 30. Kupe (lo) (Returning Spirits Song). 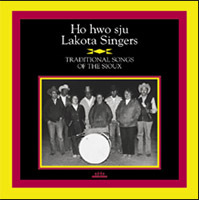 Singers: Ben Black Bear, Sr, Ervin Yellow Robe, Dave White, Harvey Larvie, Howard Bad Hand, Ron Theisz, Iva Black Bear, Sandra White, and Nona Larvie. Lakota Commentary: Ben Black Bear, Sr. Narration: Ron Theisz. 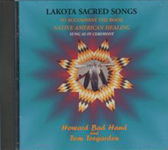 Recorded by Howard Bad Hand at Sinte Gleska College, Rosebud, SD January 19-30, 1076. This is a set of four cassettes. 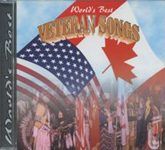 CD 1 contains 24 songs including 2 Flag Songs, 2 Omaha Songs Grass Flattening Song, Parade Song, Not Dressed to Dance, Charging or Donation Song, 2 Chief’s Omaha Song, 2 Chief’s Honor Song, 2 Veteran’s Songs, Scout Song, 3 War Party Songs, 2 Strong Heart Songs, 3 Fox Society Songs. CD 2 contains 21 songs including 8 Flag Songs, 1 Sneak Up, 1 Drum Owners, 1 Chief Song, 2 Penny Songs, 1 Omaha Ghost Song, 2 Doorway Songs, 2 Owning a Racehorse Songs, 2 Wild Horse Rider Songs, 1 Snake Dance. CD 3 contains 17 songs including 3 Rabbit Dances, 3 Round Dances, 2 Lakota 49s, 4 Owl Dances, 3 New Years Songs, 2 Winnebago Snake Dances. 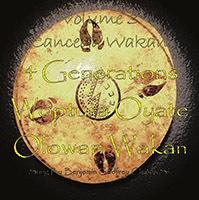 CD 4 contains 31 songs including 2 North Dakota Swing Dances, 3 Night Dances, 4 Love Song Dances, 1 Stomping or Tapping Dance, 1 Grand Entry Song, 1 Trick Song, 1 Stomp Dance, 1 Hoop Dance, 1 Gourd Dance, 1 Eagle Dance, 1 Ribbon Dance, 1 Morning Song, 4 Love Songs, 1 Mourning Song, 1 Coyote Song, 2 At Home Songs, 1 Lullaby, 4 Handgame Songs. By Rencel Last Horse and Austin Last Horse, Fourteen spiritual songs including Calling Song, Doctoring Song, Stone Song, and Four Direction Flag Song. Contains: Songs in the Sweat Lodge to the First Door, Second Door, Third Door, Fourth Door. Six ceremonial pipe songs from Little Eagle Community at Standing Rock. 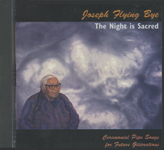 The second CD by the late Joseph Flying bye. In speech and song, the words echo: Keep the young ones safe from the selfishness of the modern world. Pipe filling and honor songs with interpretation. Howard Bad Hand and Tom Teegarden. 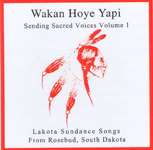 Fifteen sacred songs with Lakota and English translations. "The words to these songs are powerful...and are particularly appropriate to contemporary times. " Sixteen Lakota Pipe and Ceremonial songs by Shield, including Calling of the Spirit Songs, Healing Songs, and Emptying the Pipe Song. 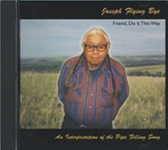 By Joseph Shields, Jr. (CD) Thirteen Lakota Pipe and Ceremonial Songs, Spotted Eagle Song, Spiritual Spider Song, and Encouragement Songs. Twelve different drum groups sing Veteran and Victory songs of World Wars I and II, and Korea. Features Whitefish Bay, Black Lodge, Red Scaffold, Stoney Eagle, and Thunder Mountain singers among others. By Lorenzo Eagle Road, Elmer Running, and Harold White Horse (CA). Thirty Yuwipi songs. by Florentine Blue Thunder (CA), Singer of the Dawn. Spiritual songs. One of the great traditional Lakota flute players. 1) The Original Flute song, 2) Brother-in-Law, 3) The Gossiper Song, 4) Sioux Falls Maiden Song, 5) Stand and Wait for Me, 6) Morning Star Love Song, 7) Why did you hurt me so?, 8) I’m crying looking for you, 9) Badlands Boy, 10) Inkpata,, 11) The photograph. 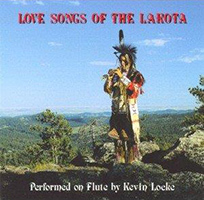 When flute songs are sung, Kevin translates the Lakota words. 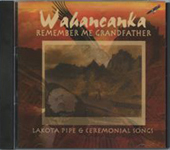 13 songs, including	Honor Song,	Grass Dance Song,	Jingle Dress Song,	Grass Dance Song,	Kahomini Song. By Lorenzo Eagle Road (CD). 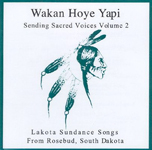 Twenty eight Lakota Vision Quest and Yuwipi songs, including Spotted Eagle song, Talking song, and Heyoka song. by Lorenzo Eagle Road (CD). 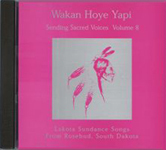 Sixteen Lakota Vision Quest and Yuwipi Songs including Heyoka, Doctoring, and Stone songs. 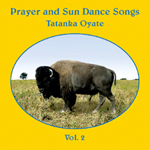 Twelve Prayer and Sun dance songs in Dakota from Fort Peck. Eleven Prayer and Sun dance songs. 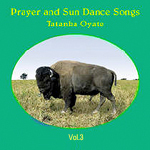 Prayer and Sun Dance Vol. III by Tatanka Oyate (CD). 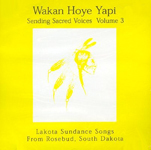 Eight volumes sung by Dwight Provancial, Harold White Horse, Florentine Blue Thunder, Roy Yellow Hawk, Lee Smith, Elva White Horse, Bea Running, and Viola Provancial. The first five volumes are cassette (CA) only, the last three are CDs only. Thirteen Prayer and Pipe songs. Fifteen Prayer and Pipe song, plus Water Drinking and Thank you songs. Thirteen Prayer and Pipe song, plus Tree song and Entrance song. Twenty-one Prayer and Pipe songs. Thirteen Prayer songs and one Pipe song. Eleven Prayer songs and two Pipe songs. 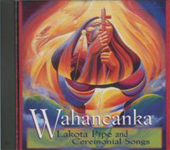 Entrance song, Eight Prayer songs, one Pipe song, and one Sending Sacred Voices Drum song. Including 1) Buffalo Nations Song, 2) The Spotted Eagle Song, 3) Sacred Turtle, 4) Spotted Eagle, 5) Animal Song, 6) Remembering Grandmother and Grandfather, 7) The Stone People Have Made Me Sacred, 8)I walk on the Red Road, 9)With this Pipe I send a Voice, 10) Pipe Prayer Song, ) 11) I Stand With This Sacred Pipe, 12) Pipe Prayer Song, 13) Pipe Prayer Song, 14) Offerings, 15) Song for Crazy Horse. including Sioux National Anthem, Veterans Honoring Song, 3 Grass Dance Songs, 2 Flag Songs, 2 Rabbit Dance Songs. The Chipps family of Eagle Butte Community on the Pine Ridge reservation traces their family back to the famous warrior Crazy Horse, Pte He Woptuh’a, Buffalo Horn Chips (variously written as Woptuh’a (preferred), waptuga, and on the accompanying CDs as Woptura (the R represents the current gutturalized H in latter 19th century written Lakota.) Chipps is an adaptation of the original family name. 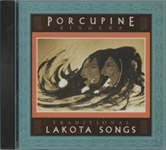 The singer on all four CDs is the late Benjamin Godfrey Chipps, Sr., a Lakota from the Pine Ridge. He was a fourth generation Yuwipi spiritual interpreter and great grandson of Ptehe Woptuh’who served as a mentor throughout Crazy Horse’s lifetime. The four CDs, which include Vol. 1 Inipi Olowan; Vol. 2 Hanbleceya Olowan; Vol. 3. Cancega Wakan Olowan; Vol. 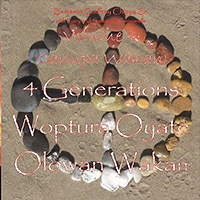 4 Four Generations Woptura Oyate Olowan Wakan are described under the website’s gallery Music: Lakota Spiritual Songs (LS 51,52,53,54). 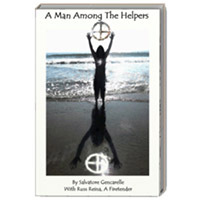 Additionally see also LS 55 Making of a Medicine Man, and LS 56 A Man Among the Helpers by Salvatore Gencarelle, author of the book and co-producer of the CD series. 4 Generation Oyate Woptura Olowan. Sacred Songs sung by Benjamin Godfrey Chipps, Jr.
Track 1. Benjamin speaking about sacred song. 2.Prayer of the Sacred Pipe. 4. Inipi 4 Winds Stone Calling Songs. 5. Inipi 4 Winds Songs. 6. Inipi Prayer Song (Look to the West). 7. Inipi Thunder Nation Songs x6. Track 1. Benjamin speaking about sacrifice. 2. Prayer of the Sacred Pipe. 4. Vision Quest 4 Direction Song. 5. Vision Quest Prayer Song. 6. Prayer Song (Voice from Above). 7. Prayer Song (4 Altars). 8. Prayer Song (An Altar is Given). 9. Prayer Song (Come to the Hill). 10. Vision Quest Offering Song. 11. Benjamin speaking about prayer offerings. Track 1. Prayer of the Sacred Pipe. 3. Prayer Song (Calling for Life). 8. Prayer Song (A Nation is Sacred). 9. Prayer Song (Spider Nation). 10. Prayer Song (People See This). (A Sacred House). Sun Dance Prayer Song 2. This is the unique story of one man’s journey into the incredible world of Native American Spirituality. For 17 years he was taught the healing practices of the Lakota.. 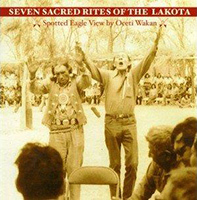 This book describes the concepts, the mentoring process, the actual ceremonies, the power of the medicine wheel and prayer, the responsibility of mankind, and the sacred gifts to human beings.